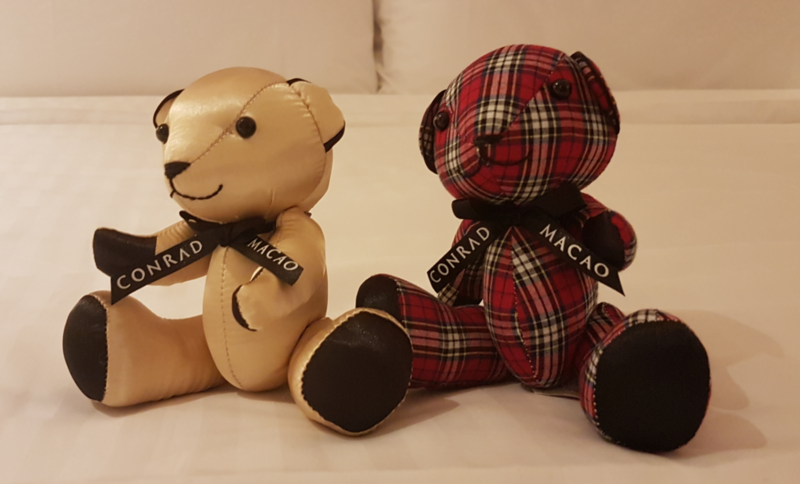 Stuffed Toys from Conrad Hotels...which ones do you have? Seoul, South Korea - Bear (must request) - additional bear(s) available for purchase. Singapore - Bear - additional bear(s) available for purchase. Tokyo, Japan - Bear - set of 2 bears available for purchase at lobby gift shop. Dublin, Ireland - "Lemmy" the (small) lamb. Upon request. I received the CNY rubber ducky as well. Red with a golden beak, and its wings in the pattern of the CNY bear above. A friend staying in another room received the regular one with the dice inside - and no bears. Obviously, I now will aim to stay at Conrad whenever I can. Darn marketing gimmicks. I am looking forward to seeing your collection of toys over the next year. AspirationalFF and thefilipinotraveler like this. I stayed at Conrad Hong Kong this week, but no special CNY plush. I got two bears and a normal duck. And a cool octagon box filled with red Chinese New Year envelopes! Happy to sell them to anyone missing these in their collection. a: pre or at checkin? I was also there last weekend for CNY. one per stay, but if you ask nicely in the lounge, they will deliver more. I got 4 for one night!!! no need to ask for the standard two. They’ll will be waiting on your bed. Stayed in Hong Kong and was introduced to this crazy world. The bear was a big hit with my three year old daughter. Last week was in New York and asked for the bull (success!). Another big hit. Now my accommodation is out of my control. If I go away, I am expected to get a new Conrad toy! Staying in Bangalore next week and urgently trying to see if I can switch my booking to the recently opened Conrad there (but cannot find evidence of a toy being offered yet... it only opened in January). Singapore next month. And Manila the month after. I fear I am developing an addiction. AspirationalFF, Tokyoite, thefilipinotraveler and 1 others like this. My girlfriend tried to let a 2 year-old visiting for the day play with one of my Conrads. She received a stern warning that these are not for children! Following this conversation, I'm definitely thinking that there is huge marketing opportunity here that Hilton isn't capitalizing on... I'd guess they could drive a lot more stays if more people (especially collector-types) knew that the Conrads provide signature stuffed toys, and if they actually did provide such toys consistently. I agree one gets sort of addicted collecting these bears. 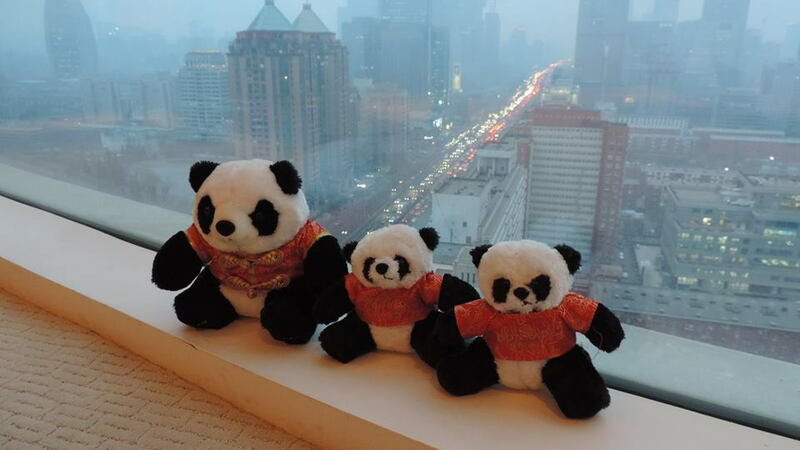 I stayed in Conrad Beijing last Tuesday. I initially booked the Hilton Beijing Airport since my flight the following morning was at 8:25 but then thought I might not be able to be back to Beijing soon so booked the Conrad. 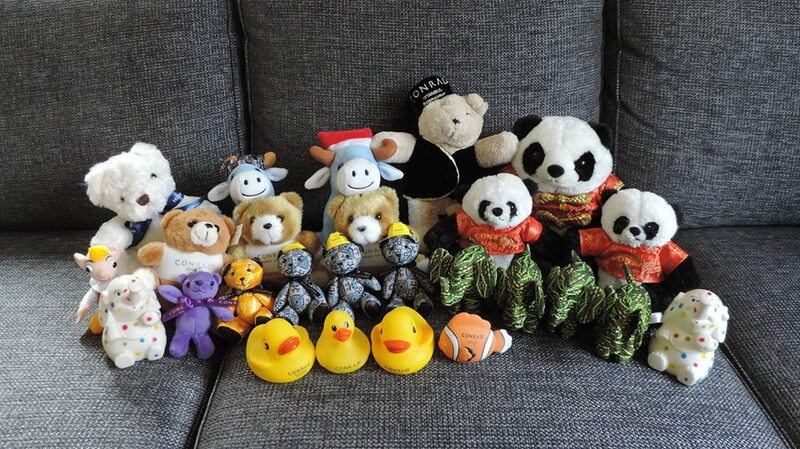 I got 2 panda bears and the big one I bought from the basement shop for 125 SEK. It was the last one as per the staff so he gave me the one on display. I'll try to post my own collection when I get back home from my trip. SanDiego1K, restlessinRNO, cruisingmickey and 1 others like this. 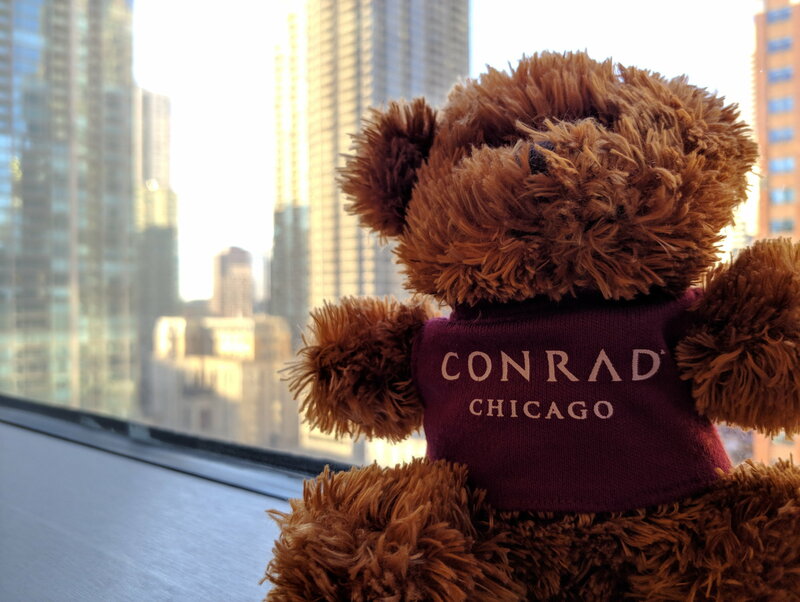 Anyone stayed recently at Contad Chicago that can confirm if they have any stuffed animal? i have an upcoming trip and considering staying there or at least to stay 1 night to get it for my collection, if they have it of course. Otherwise prefer to stay at different hotel for this trip. yes they do, it’s a small bear, you need to ask for it though. May also be limited to those travelling with children. I have a preference for "local" animals (like the Carabao in the Philippines) rather than the bears. I hope that when the London NYC reflags as the Conrad NY Midtown, they pick something like the lions from the NY Library or even a grey squirrel from Central Park. cruisingmickey, SPBanker, Tokyoite and 1 others like this. I fear I am developing an addiction. [...] but then thought I might not be able to be back to Beijing soon so booked the Conrad. SanDiego1K, restlessinRNO, krazykanuck and 8 others like this. @Doctorslices is the bear something they give you or from the gift shop? the bear looks big! @thefilipinotraveler where's the baby blue plush from (is it a moose?) and the nemo? It's Carey the Carabao from Conrad Manila. The carabao is our national animal The nemo is also from Conrad Manila but I guess they don't give them anymore.